Holbox ("black hole" in Yucatec Maya) is an island in the Mexican state of Quintana Roo, located on the north coast of the Yucatán Peninsula. It is approximately 41.84 kilometres (26.00 miles) long and 1.5 kilometres (0.9 miles) wide, and it is separated from the mainland by 10 km of shallow lagoon that is home to flamingos, pelicans and other rich birdlife. Holbox Island is part of the Municipality of Lázaro Cárdenas and also part of the Yum Balam Biosphere Reserve. Not yet heavily touristed, the island's main industry is fishing. However, the island is developing a growing tourist industry in the form of whale shark viewing. Lobster is the main product of this fishing, and many of the dishes made on the island center around lobster or other seafood. The first mentions of the island were in 1852 from a document sent by Don Bartolomé Magaña to the Governor of Yucatán. 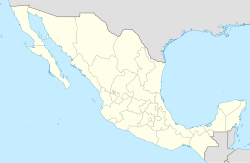 The adjacent mainland was frequently attacked by the Maya therefore people sought refuge on this island. The government wanted to keep people from living on this island but the citizens refused to leave their homes. Hurricanes in 1886 completely destroyed the island, but the island was rebuilt following. Holbox has one of the safest beaches for learning how to kiteboard. Conditions are ideal for beginners, as the beach has shallow waters, no big obstacles on the wide and long beach, many days of wind during the winter months, and a nearby school with professional instructors. Advanced riders can find also very good conditions when the north or south winds reach 25 knots or more. The climate is subhumid warm, creating a stable and consistent temperature year-round. ^ Census Results by Locality, 2005 Archived 2011-07-22 at the Wayback Machine INEGI. ^ "How to get to Isla Holbox? used". wavesnbackpack. Retrieved 28 March 2017. ^ Administrator. "History". www.holbox.gob.mx. Retrieved 2017-05-01. Wikivoyage has a travel guide for Holbox. 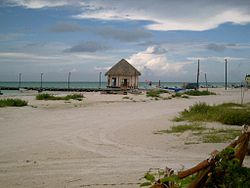 Wikimedia Commons has media related to Holbox. This page was last edited on 12 February 2019, at 22:53 (UTC).